Outside of an overtime win against the Saints, the Chiefs have been unwatchable this season. The team's most damning mark of failure is the fact that it hasn't held a lead in regulation in its first seven games, a streak that remains intact after Thursday's 31-13 loss to the Chargers. Head coach Romeo Crennel isn't going to sit by idly as the second half of the season sinks deeper into the shitpile, though. He's making moves. The team released starting corner Stanford Routt, who was cut by the Raiders in February a year into his five-year, $54.5 million contract. 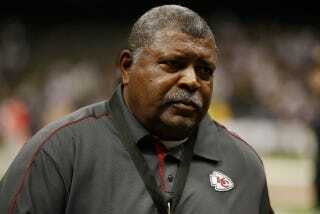 Also, the defensive-bred Crennel relieved defensive coordinator Romeo Crennel of his duties. Wait, what? In an effort to fix some of the many problems ailing the 1-7 Chiefs, head coach Romeo Crennel announced today that he has giving up his duties as the defensive coordinator, handing them over to linebackers coach Gary Gibbs. Yes, Romeo Crennel essentially fired himself.